We are explorers and travelers of life! This is a beautiful park with many gorgeous views of the surrounding mountains. The sites are spacious and private. There are many beautiful trails for hiking biking and walking. 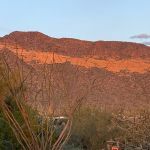 We camped at Usery Mountain Regional Park in a Motorhome. We stayed 3 nights. We stayed in section C - but Section B is also very nice. (Didn't go into section A) Just look at the map when booking. Our site was a spacious pull through with FHU. Plenty of room for our 37' RV. There was a 42" near by as well, with plenty of room. We had a view of the rollings hills and surrounding meadows. There was several trails to explore around the lake, as well as places to bike, and walk the dog. We saw a few playground areas and splash pad for kids. There is also a large, beautiful day use area with picnic tables. The lake is nice for small boats and fishing. The only disappointment was that the only kayaks allowed on the lake are the sit IN type. We have Cobra Explorers sit on tops, and those are strictly prohibited. I gave four out of 5 stars because of the kayak rule and the fire ring was full of glass and debris from the previous occupant. While we didn't use it we had to clean it up so our dog wouldn't investigate the debris and glass. Over all we really like this park and will return with friends! 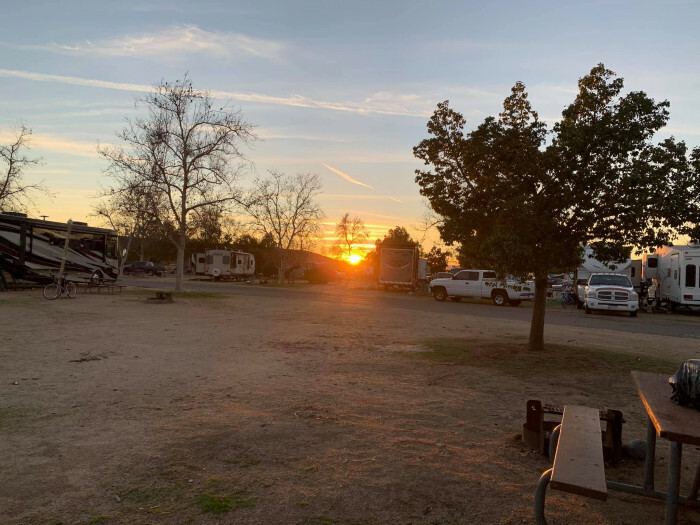 We camped at Lake Skinner Recreation Area in a Motorhome. 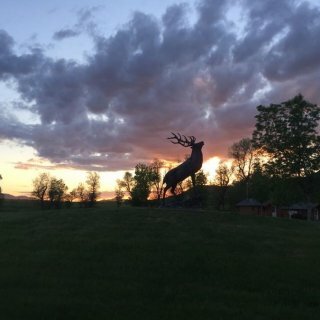 What a gem of a campground. We stayed 4 nights in this little quiet, hidden canyon. The river runs along the edge with a small inlet for swimming and kayaking; (be aware of a swift moving current in the outer section of the inlet) good launch spot for small water craft. A few good hiking trails right from the campground. No sewer at site but dump station at exit. The camp host was very friendly and helpful. We were very happy with this location, it is far away from the big city parks and crowds. The bonus is a sister campground down stream that we could kayak down to. The canyon views are great. We camped at River Island State Park in a Motorhome. 4 miles to the north is Parker Dam, and Havasu Spring Resort with boat rentals, a dock and a restaurant "The Springs" food and cocktails. Plenty of opportunity for water fun and a small 9 hole golf course. Beautiful Campground, though a bit tight. Amazing views and very nice local walking trails right from the base camp. Close to the Monument Valley Tour and nearby trails. Definitely a great place to stop on our way to MOAB. We camped at Goulding's Lodge & Campground in a Motorhome. This is a beautiful and extremely large park. The staff were very friendly and helpful. The little store inside is well-stocked and has a surprisingly large number of items. The pool area was beautiful and had just opened the week and we came in. It was our first time there; we didn't get to choose our site or location (next time I know to request a different location) we were so looking forward to going to this RV resort but our site was way up in the front right next to the cabins (when there was a wedding going on) and we were right up on the road so we heard the road noise all night. 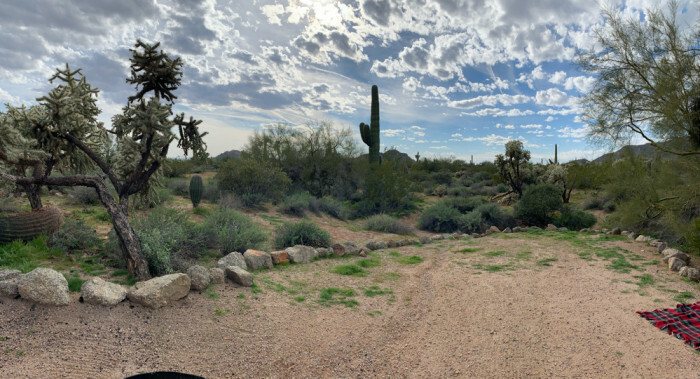 There are truly many other sites that we could have been placed in because the campground wasn't very full but we just didn't know in advance to ask for one of those. Aside from that I think we'd stay here again because it is a beautiful well maintained park. The spaces have grass surrounding, and they are well spaced apart. Check in was very easy and smooth. Overall we really enjoyed the park and will try it again! 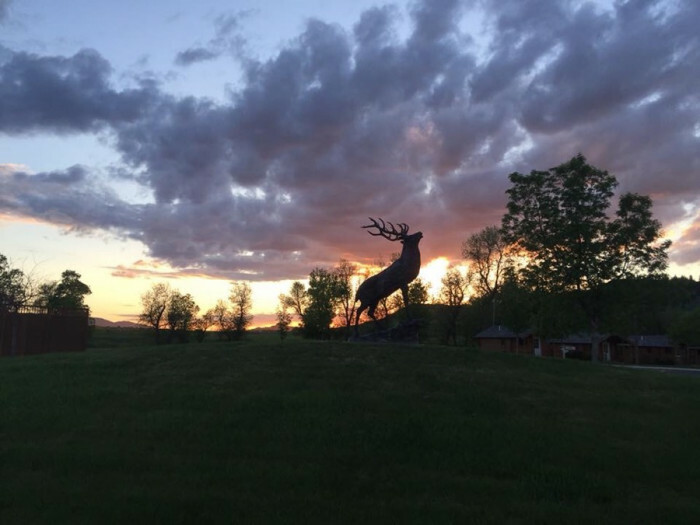 We camped at Elkhorn Ridge RV Resort & Cabins in a Motorhome. The nearby Tatonka Experience is definitely worth a visit! Mt. Rushmore is about an hour a drive. Deadwood is an excellent place to visit, great restaurants, shops, and historic sites/ buildings. We went twice because we liked it so much! Staff was very nice and helpful. Campground was clean and easy to get to and our site was level. That being said - this was a very expensive night on the FREEWAY... it was so loud even our ear plugs could not drown out the noise. Horrible experience. Just understand that you will pay $50 for a night on the freeway - the noise never stopped. The train came by twice but was not as loud as the freeway. We camped at Denver East / Strasburg KOA in a Motorhome. This is an amazing park! It's situated in town but still feels like the beautiful serene Sonoran Desert. All sites are clean and spaced well for privacy. Sites are level and easy to navigate. No sewer at site but dump station is on site. The pull through sites are sort of "off street" and much less private than the back in and there are plenty of back ins with ample room for Big Rigs. The natural landscape was spectacular and the trails were clearly marked and descriptive on park maps. We had a gorgeous mesquite tree on our site which provided great shade. Not all sites have shade. Each site has a lot of room to spread out. We camped at Cave Creek Regional Park in a Motorhome. Visit the Nature Center for local facts and trail maps. 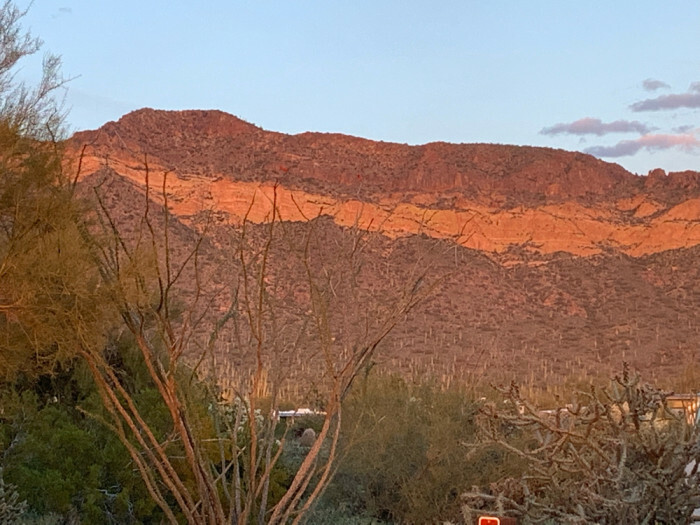 Also for some local fun definitely go into Cave Creek for some Cowboy fun and visit the Buffalo Chip Saloon for Bull Riding and great food! Very fun! There are several trails for hiking and mountain biking that range from easy to difficult. This campground is centrally located to everything but still feels quiet and serene. We love this park! We stayed in Roadrunner Campground up on the hill - lakeside over looking the lake. Our site was a pull through so extremely easy to navigate but the back in sites are also very nice. Most sites are positioned very well to maximize privacy and space between. Shade is provided by a fixed cabana covering the stone picnic table. It was extremely windy every night. We stayed in winter so it was very quiet and mostly empty. There are slot of trails to explore, beautiful wildlife and flora to enjoy. The only negative - which will likely cause us to not return is the rangers have banned all E-bikes from the park. We have peddle assist ebikes and camped here specifically to explore the roads and trails but the ranger told us they just don't know enough about these yet so they just don't allow them. This is a huge disappointment. There was a man on a scooter zipping all through the campground but apparently that's allowed. 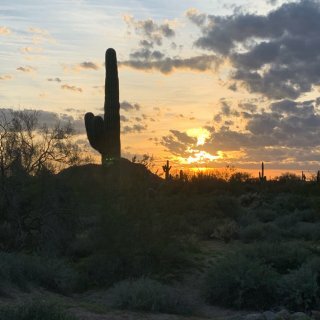 Unfortunately this ambiguous rule may prevent us from returning to this beautiful park We camped at Lake Pleasant Regional Park in a Motorhome. Very nice little park. Clean and maintained. Popular with snowbirds. Very quiet during the time we stayed - just one night for a stop over. 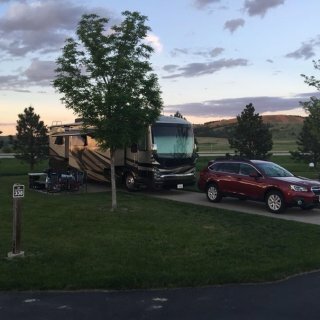 RV sites are all grass with several tree's spaced apart for shade. We reserved online without knowing what to expect and thought our site was riverfront, but in fact ALL riverfront sites are dry camping for smaller/tent (no generators allowed in the park) but walking distance to the river with a launch ramp. The staff was amazing, friendly and knowledgeable. Other campers were friendly as well. Easy to back in to sites. We are 37' with a toad and had no issues at all. We'd definitely stay here again We camped at Mayflower County Park in a Motorhome. 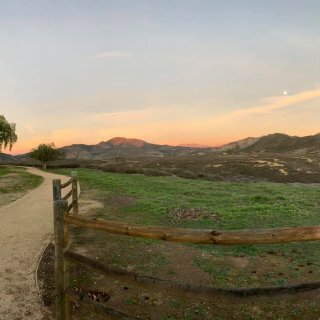 This Beautiful campground has panoramic views of both ocean and hills from every site. It is located across Coast Highway - not on the beach side, but the sites are large and semi private; they are tiered and offset making each one feel private, the natural vegetation provides barriers and each space has plenty of room to set up chairs, fire ring etc.. great for outside living. The roads are clear and unobstructed and are all one way loops. 35' 38'are fine, but require some patience on the turns. Our site was very level. Plenty of parking for your tow vehicle. There are dozens, of walking, hiking and biking trails down to the beach or up into the hills. From our site we could clearly see Catalina Island and north to Long Beach. The sunsets are amazing and the night sky was beautiful. Full Hook ups but no sewer (there are three dumps stations at the exit). There is a a lower parking area for trails and beach paved and steep. 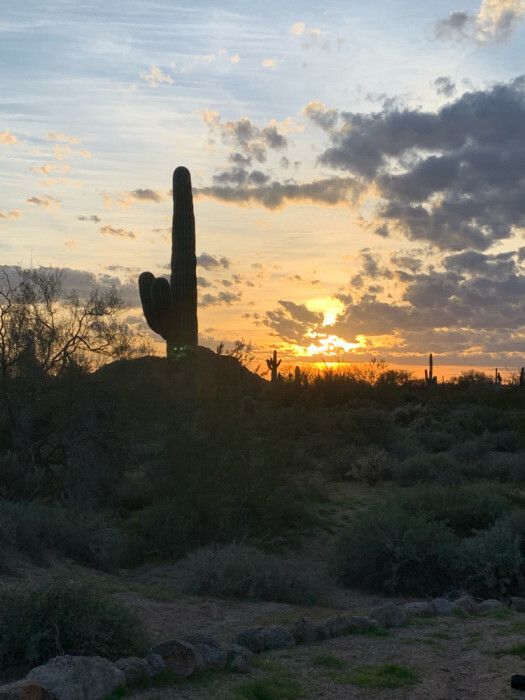 This is a pricey state park, the beauty and tranquility certainly do help to offset that fee, but it is considerably higher priced than most. We camped at Crystal Cove State Park - Moro Campground in a Motorhome. Beach is across Coast Highway, The Historic Crystal Cove Cottages are there, as well as "The Beachcomber Cafe"-fantastic location and well worth the short walk down it. There is a trolley that can take you down as well from the day use site - ask the ranger. 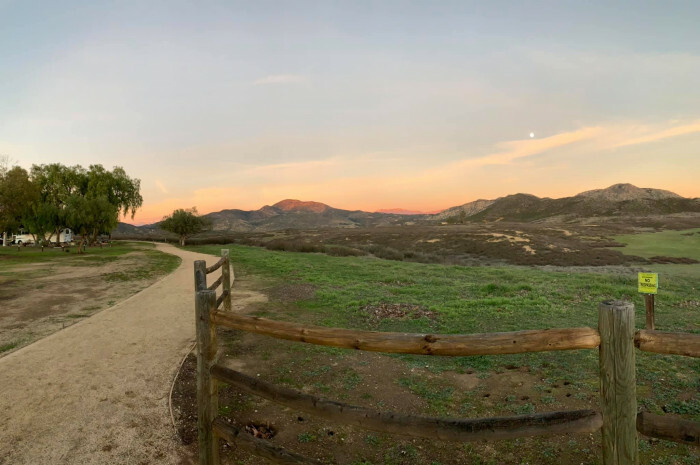 Beautiful park with clean driveway sites and a patch of grass on each; with views looking at the Palomar mountains and beyond. Some sites include a barbecue. Large wide roadways easy to navigate and turn. 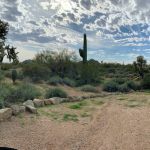 This campground was a nice surprise and was immaculately clean the staff was wonderful friendly and helpful. We heard horses playing in the field in front of the campground and wash hawks flying overhead near the meadows. We were here during the week and it was very quiet and serene. Will definitely come back. We camped at Pala Casino RV Resort in a Motorhome. We loved this park and will return again. Our site was a pull straight in site facing the river with the constant sounds of water rushing by. It was roomy enough for our 37' rig with four slides and the toad parked behind it. We had the grassy park area on one side of us with large tree's - which was nice. Families / kids played during the day. That area has a small beach. The park was pretty good sized and quite full, but was quiet at night. We had a picnic table but no fire ring. I think we could have requested one be delivered, but we didn't need one so it was not a big deal. We spent our evenings sitting in our chairs up on the bank watching the river flow. It was spectacular. The approach was easy to access, however we almost didn't see the sign to turn in off the road. We hooked up the tow vehicle just outside the park gate as the turns getting out were tighter than the turns getting in. Nice sized pool area. They offer WiFi and cable TV. BUT! The WiFi was literally nonexistent. If that's important to you, it will be a problem. We had no WiFi and no phone service at all (Sprint). It was inconvenient but we loved the site so much it didn't matter for a few days. Our front window faced the trees and river. 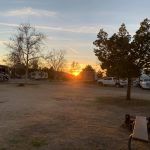 We camped at Sequoia Campground & Lodge (formerly Kaweah Park Resort) in a Motorhome. Very close to Sequoia - one of California's greatest sites. We rented a small boat for an afternoon on Lake Kaweah. That was beautiful. We swam in the lake; it was warm. The river at the park was a fun place to cool off too but was very cold. We bought some snacks from the little store across the street from the park - everything was stale. Not so good. If you go to the lake marina they have a small store and snack bar. We had a pull-though site which was roomy enough for our rig, all four slides and the tow vehicle. There was really nice "front porch area" space with a picnic table and a fire ring. It was all gravel. We were in site #30 and we happened to be there during the week so the park was relatively empty. While we really enjoyed this site it was right across from the playground and group dining area. It just so happened no one was in the site next to us. Tent camping was directly in front of us and the cabins were directly behind us. We suspected this site would have been very loud and busy on a weekend. But for our stay it was fantastic. There is another entire area (maybe for longer stays or full time living) which is on the front - lower half of the park and far from the main activities area. The park was laid out well and has a good sized pool area and the playground was very nice, lots of fun for kids and a great place for families and pets! The office staff was very nice and efficient. We camped at Angels Camp RV & Camping Resort in a Motorhome. We drove into Columbia and walked for a few hours through the historic state park. Be sure to stop in the saloon for a cold one! Local beers as well as sarsaparilla on tap! Close by is also Sonora with beautiful architecture and shops. If you are looking for a great lunch visit "Mi Pueblo" on Washington Street. (in Sonora) You can eat a delicious lunch outside on the patio and watch the creek flowing by. Nice little park. Very clean and quiet. We did not hear any freeway noise from our site. The pull-in sites are easy to navigate (the park manager was a great navigator!). However they are tandem and not quite private, as they are close to the next one. Our coach fit fine though we were too close for comfort to the neighbor, It was a little unnerving seeing them pull in and set up. We held our breath a few times. If you stay our suggestion is, if possible, not choose a pull-through site. The park is close to Shasta and there are some stores close by. There are long term renters in the back area of the park. The two managers are about the friendliest we have ever met. Very kind and helpful. WiFi and Cable TV worked great. 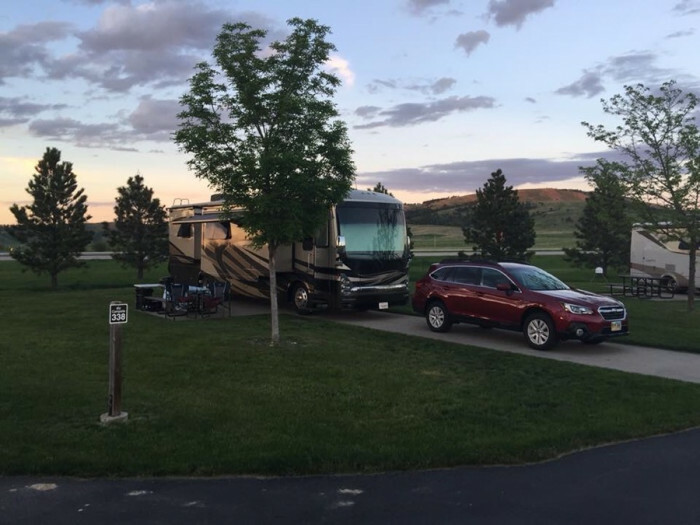 We camped at Friendly RV Park in a Motorhome. Close to Mt Shasta and nearby Shasta Lake. Great Mexican Food restaurant within walking distance. Great shore-front park. Full hook ups, pull through site. Clean and quiet. This was close to everything. The manager was very friendly. The police cruised through the campground a few times - but nothing alarming. Great views and close to the small harbor. Just a few steps to the beach. We loved this park for the price and location. Ours was a pull in straight site - facing the ocean. Tow car parked right behind the rig; a manager complained that we were parked on the grass; there were no options to park next to rig. The downsides: Phone coverage (Sprint) was literally zero. The Wifi did not work at all the entire stay. This is a wide open fairly flat park; It just so happened to be extremely windy during our stay. No fire rings or picnic tables at all. Super easy in and out. Tow hook-up and un-hook very easy. We camped at Shoreline RV Park & Campground in a Motorhome. Chart House had a pretty good breakfast with fresh crab an shrimp with a great view of the harbor. Go see the lighthouse at high tide. Jedidiah Smith Park is a must see!